In 2009 I did a drawing of Weeping Roses. 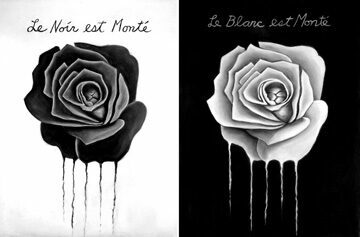 One was a black rose on a white background, the other of a white rose on a black background. The image was used on multiple websites and personal pages as it was easy to copy and paste on various pages. It has also been used on a cover of a CD and for a group protesting Sea World. Till this day I still find it by searching Weeping Roses. I’m rather flattered it has been so popular. These cast paper roses would involve an introduction to recycled paper making. And will incorporate wild flower seeds or herbs. Then colored and mounted on a wall. Viewers can purchase them as a donation to the botanical or rose garden and take them home to be planted. The wild flowers will attract butterflies and bees and others can enjoy some fresh herbs. This project could be incorporated with a educational tour provided by a "Rose Garden" as a way of teaching the children about the various flowers and colors. 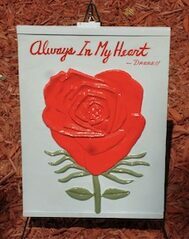 Through observation and study the kids can get some ideas for completing the project mentioned above or create plaster markers or step stones for a rose garden. They will receive a small heart and 5 x 7 cast paper for them to color, but by paying it forward they will produce each for the next child. I hope to help raise funds and obtain sponsors that will provide operating monies for materials, rubber molds, plaster, paper pulp and paints. As well as publicity and awareness to the community. Help with funding for this project will be appreciated. If you would like to donate please click on the Donate button or if you have materials and art supplies that you would like to offer please e-mail me at the contact list below.